6.13.2013. It was a chilly, dark day here in Great Falls. We were glad to head for the museums. First: Paris Gibson Square -- a fine place to be inspired by local crafts. 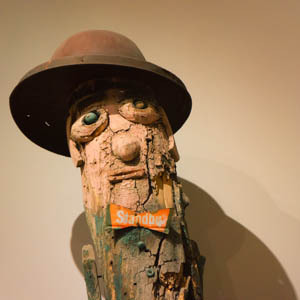 Our favorite exhibit was the outsider art of Lee Steen -- who turned trash into treasure but most notably turned tree branches into totems -- or large-scale "tree people" -- with the addition of bottle-cap eyes and junk-made features (see below). 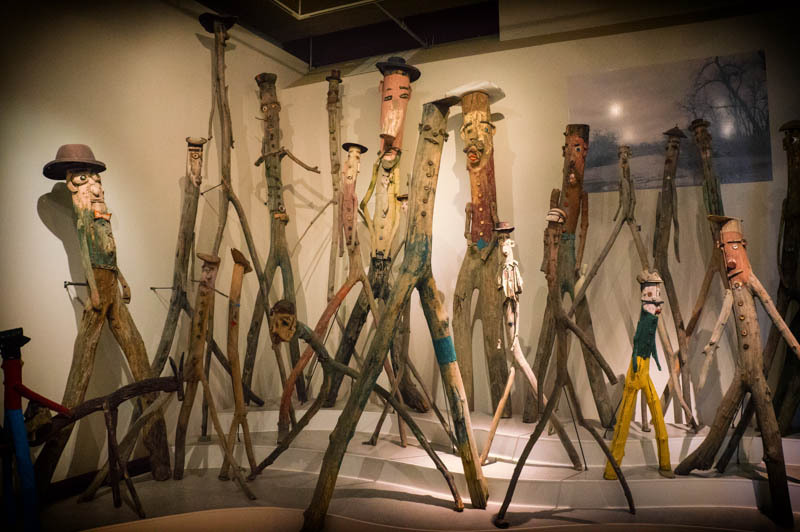 It was the sort of exhibit that makes you think: "Why can't *I* be that crazy?" Next we went to the Charles M Russell Museum Complex. A fellow St. Louisan, Russell is big here as THE cowboy artist of Montana. 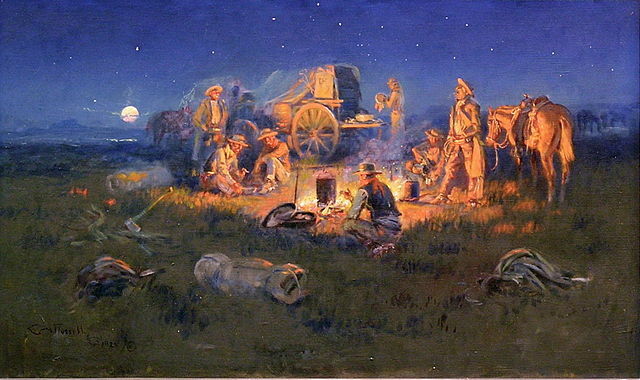 Below is one of his famous paintings "Laughs Kill Lonesome." 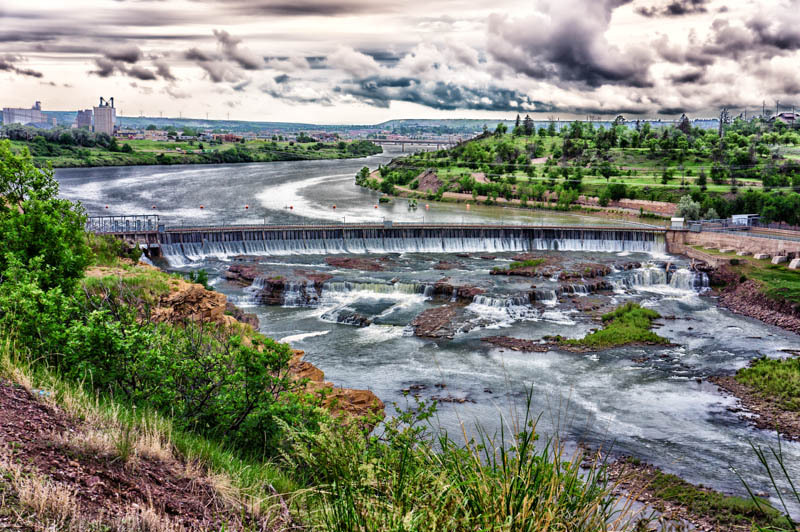 The big history here in Great Falls is Lewis and Clark. There is a grand interpretive center along the Missouri River here, said to be the best west of St. Louis. Yes, it is quite wonderful, even though the volunteer docents wanted to talk our ears off. The thing I liked was that the property overlooked the Missouri River and a critical juncture in the L&C expedition. Here was a fork in the river they'd been travelling -- do they go left or right? Which one was actually the Missouri? The locals informed them that the Missouri was the one with the impassable cascading water falls. Rats. But our intrepid explorers were faithful to their mission and ordered their expedition to undertake an 18-mile portage to bypass the treacherous river bend. Now the falls have been dammed and put to work producing hydroelectric power. See today's photo at the top of this page. It was interesting for us to gaze again upon the Missouri River. Eleven days ago we were observing its flooding just northwest of St Louis, as we were leaving there. Oh, look at this map below. 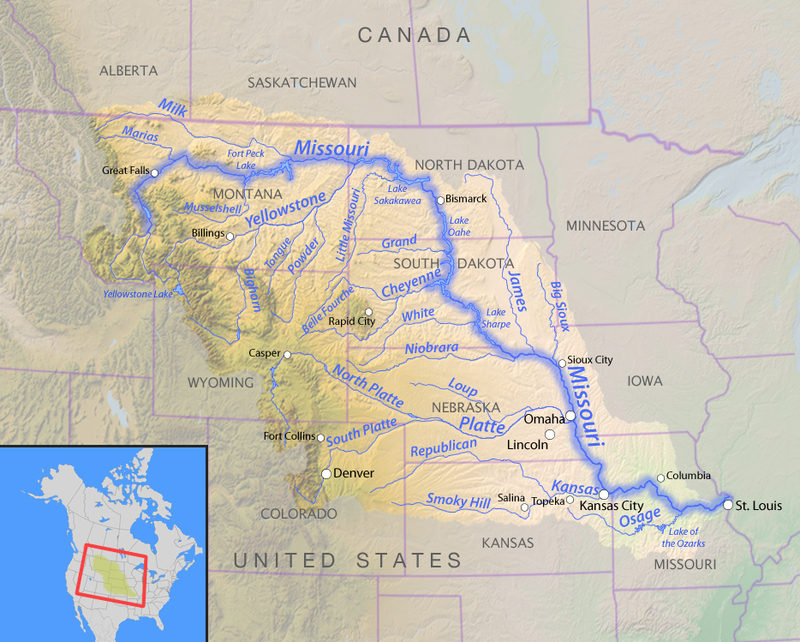 I wonder how close we came to the actual Missouri River source right around Helena. Tomorrow we will be following it into North Dakota. Roll on, Big Muddy.